VJ party Wednesday: It’s a book launch party edition of Eyewash, the live video series. I’ll be VJing with Korg hardware and Quartz Composer-generated visuals, along with the book’s DVD creator Melissa “Miixxy” Ulto (previously on CDM). Jay Smith from Livid Instruments will be demoing the new Tactic M2 wood-paneled VJ control surface (see previous story). I’ll be trying to steal it from him. Watch your drinks, Jay. 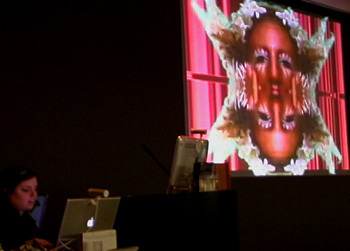 VJ: The Movie Video Out documents the history of VJing and live video art from the 1960s to today. It’s premiering in the East Village November 11, but if you clamour hard enough, it may come to your town, too. Music Player Live: Les Paul is keynote speaker for this weekend full of of music stars, gear, and instruction. The crew from Keyboard, EQ, GuitarPlayer, BassPlayer, and Frets will all be there. Catch my live video and VJing for musicians seminar Sunday, if you can, but there’s plenty of other good stuff happening. Game Boy Music Saturday: There’s a major lineup Saturday night of Game Boy and chiptune musicians at Manhattan’s The Tank (which is still looking for a permanent home). Performers: DAVID SUGAR (UK), RECEPTORS (US), HEY KID NICE ROBOT (US), M-.-n (BE), GLOMAG (US), BUBBLYFISH (US), OMAC (US), NULLSLEEP (US) and BIT SHIFTER (US). Now, attention rest of the world: aside from Paul’s VJ book and the movie, we want to make sure you get to enjoy some of this, too. So, New Yorkers, aside from my own feeble attempts to photograph and document these events, if you’re going and want to help, please drop me a line. And certainly say hello; I’ll buy you a drink or steal you some video hardware.